Using Pieter de Marees' Description and Historical Account of the Gold Kingdom of Guinea (1602) as her main source material, author Elizabeth Sutton brings to bear approaches from the disciplines of art history and book history to explore the context in which De Marees' account was created. Since variations of the images and text were repeated in other European travel collections and decorated maps, Sutton is able to trace how the framing of text and image shaped the formation of knowledge that continued to be repeated and distilled in later European depictions of Africans. She reads the engravings in De Marees' account as a demonstration of the intertwining domains of the Dutch pictorial tradition, intellectual inquiry, and Dutch mercantilism. At the same time, by analyzing the marketing tactics of the publisher, Cornelis Claesz, this study illuminates how early modern epistemological processes were influenced by the commodification of knowledge. Sutton examines the book's construction and marketing to shed new light on the social milieus that shared interests in ethnography, trade, and travel. Exploring how the images and text function together, Sutton suggests that Dutch visual and intellectual traditions informed readers' choices for translating De Marees' text visually. 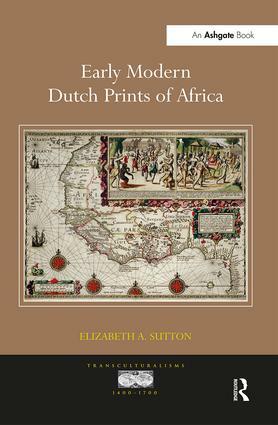 Through the examination of early modern Dutch print culture, Early Modern Dutch Prints of Africa expands the boundaries of our understanding of the European imperial enterprise. Contents: Introduction; Negotiating trade and travel in North Holland; The Description and Historical Account of the Gold Kingdom of Guinea by Pieter de Marees; Analogy and anthropology; To inform and delight; Emblematic map borders; Legacies; Epilogue; Bibliography; Index. Elizabeth A. Sutton is Assistant Professor of Art History at The University of Northern Iowa, USA.